During the Second World War, the father of the renowned Israeli caricaturist and lecturer Michel Kichka lost his entire close family and spent some years in a concentration camp, finally returning to his native Belgium, where he started a family and had two daughters and two sons. For his children, his war experiences were a burden from which – each in their own way – they tried to escape. Kichka’s novel is as exceptional as it is moving; it presents the experiences of a man whose life was heavily marked by history. 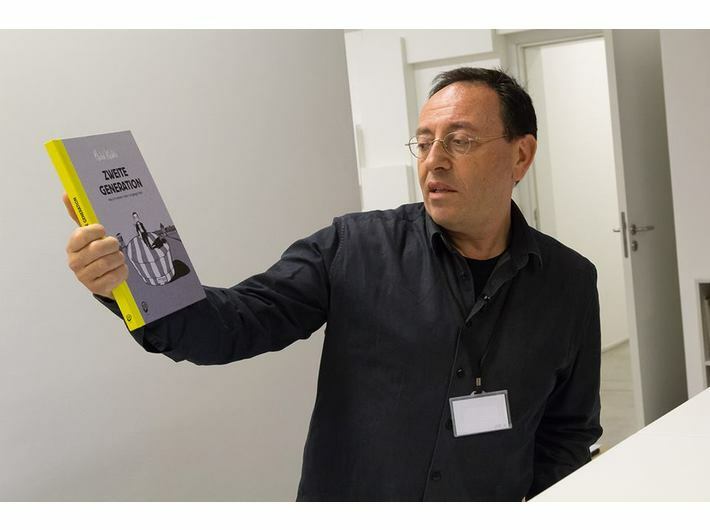 The original drawings for the first French edition of the comic were presented at MOCAK as part of the exhibition Poland– Israel – Germany: The experience of Auschwitz in 2015. The encounter with the author and the workshop will be conducted in English. Free entry. Maria Kobielska (b. 1985) – in 2014 she defended her doctoral thesis at the Faculty of Polish Studies, Jagiellonian University, where she works at the Department of Anthropology of Literature and Cultural Studies. A graduate of Polish philology, philosophy and cultural studies, she held a scholarship from the Foundation for Polish Science as well as from the Minister of Science and Higher Education. The author of a monograph on Jerzy Ficowski and numerous academic papers, she is currently working on a book about the Polish culture of memory in the 21st century. Her academic interests include research on the Polish literature and culture of recent years in the context of memory, past and politics. Joanna Ostrowska – Ph.D. in history (the Faculty of History, Jagiellonian University), graduate of the Institute of the Audio-Visual Arts and the Chair of Jewish Studies, Jagiellonian University as well as Gender Studies, University of Warsaw. She also studied film and TV production organization at the Film School in Lodz. She was a scholarship holder of Socrates-Erasmus programme at Humboldt-Universität zu Berlin. Member of Krytyka Polityczna and Restart teams. She lectures at the Chair of Jewish Studies, Jagiellonian University, Gender Studies, Jagiellonian University and University of Warsaw, Institute of Literary Research, Polish Academy of Sciences, Studio of Borderline Questions, Adam Mickiewicz University and Open Jewish University.